Coco Review | Another one of Pixar's all-time great films. 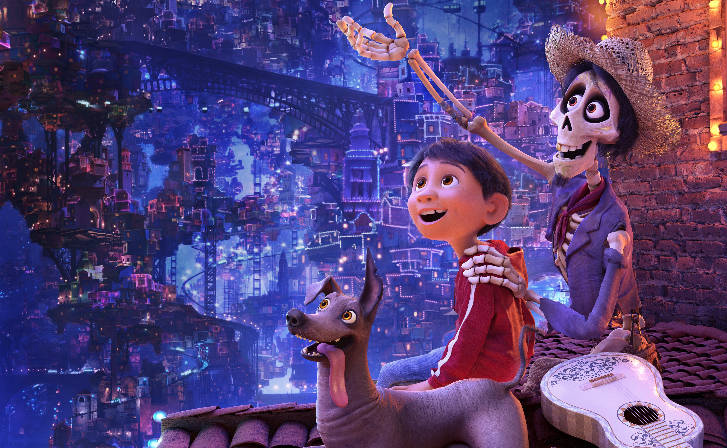 "Coco is good proof that Pixar hasn’t lost that enterprising spirit." "Coco is tackling some of the same issues that interested Inside Out"
When a movie like Coco comes out, it reminds you just how much creative energy Pixar is squandering on its obligatory sequels. We differentiate Coco from those movies by calling it an “original idea,” but Coco is chock full of familiar elements, recalling recent films in Pixar’s own catalogue (Inside Out) and in other studios’ catalogues (Fox’s The Book of Life). Coco is not Pixar’s best film since Inside Out because it’s “completely original,” but rather, because it finds that sweet spot between the familiar and the fresh. Something we’re not seeing from disappointing sequels like Finding Dory and Cars 3. Coco is also Pixar’s attempt to be a standard bearer of demographic and cultural inclusiveness, as it features a cast and characters entirely of Mexican (or at least Latin) descent. This is no minor gesture. A movie of this size and scope has to hedge its bets toward maximum profitability, and setting the movie entirely within one non-American setting, even if the dialogue is in English rather than Spanish, was a big risk. Predictably, the movie hasn’t cleaned up at the box office like some of those sequels – what original movie actually stands a chance against a known commodity? But it’s been a solid enough performer for a studio once willing to gamble on challenging properties like Ratatouille (a movie set entirely in France) and Wall-E, and Coco is good proof that Pixar hasn’t lost that enterprising spirit. The word “spirit” is a good jumping off point for this story. Pixar’s foray into Mexican culture takes Dia de Muertos (Day of the Dead) as its inspiration, following five generations of a family of Mexican shoemakers, some on each side of the barrier between the land of the living and the Land of the Dead. Spirits need to cross bridges constructed of luminous orange flowers every year on the 30th of October, when they can visit their living relatives if their picture has been featured on an “ofrenda” – a candlelit wall of photographs of deceased ancestors. If they’re not remembered in this way, they can’t go. If they cease to be remembered by anyone who’s still living, they disappear from existence entirely. “It happens to everyone eventually,” says one character with a bemused resignation. In this way, Coco is tackling some of the same issues that interested Inside Out. Instead of colourful marbles rolling around inside the brain, you’ve got shimmering images of relatives you lost long ago, whose faces you wouldn’t be able to remember if it weren’t for the photos on the ofrenda. This film’s version of Bing Bong, Riley’s imaginary friend who was trying not to be forgotten in Inside Out, is Hector, a jovially hopeless fellow trying to evade bridge security yet again, having missed being featured on an ofrenda for the umpteenth year in a row. He’s trying to see his daughter, the only person who still remembers him, or risk disappearing altogether, Marty McFly style. Hector is not the only one trying to get over to the other side, but his companion’s circumstances are far more unusual. Miguel, a living boy in the central family of shoemakers, has inadvertently crossed in the wrong direction after being cursed when he tried to borrow a sacred guitar from the mausoleum of a local musical legend. To get back, he must be given the blessing of his ancestors – a blessing they only want to grant if Miguel will agree to abandon his musical ambitions. See, it was music that tore up their family when Miguel’s great great grandfather left his great great grandmother to pursue stardom – and Miguel has just discovered that his hero, famed singer-songwriter Ernesto de la Cruz, may actually be that man. No one knows what happens when you die, but it sure is nice to imagine taking up residence in a beautifully festooned afterlife of wild colours, chockablock architecture teetering upward in great towers, swooping spirit animals and other inhabitants who look sort of like living versions of themselves, only skeletonized. 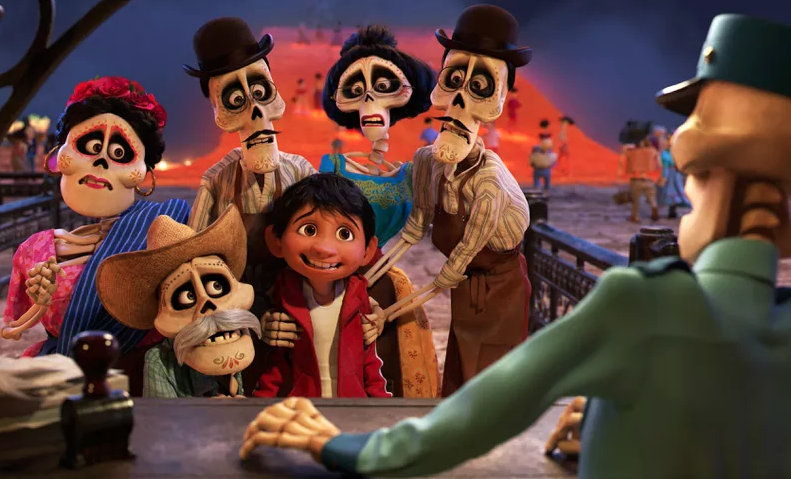 Pixar’s artists have gotten one of their most rewarding assignments yet in outfitting the Land of the Dead, which seems like a great place to spend another seven or eight decades until everyone alive stops remembering you. The place also makes you recognise why a person would fight for any chance at immortality, like that enjoyed by Ernesto de la Cruz. If you become a legend, you could live here forever. 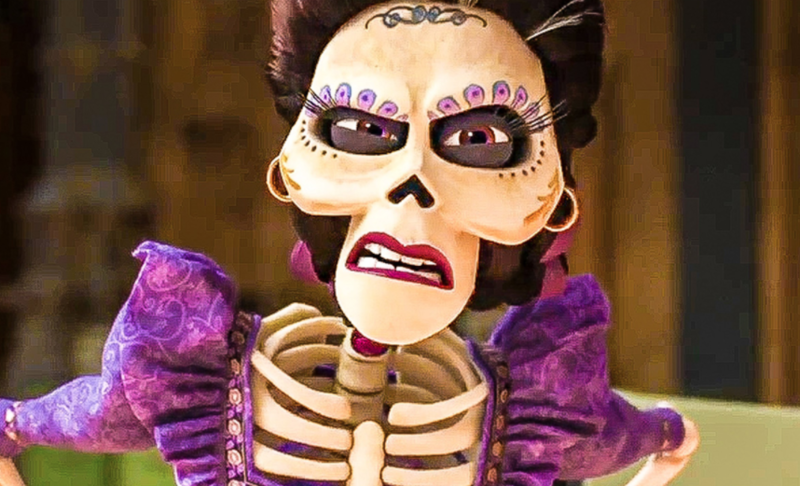 That kind of greed doesn’t motivate most characters in Coco, though, which is where Pixar’s trademark heart kicks in. The film kind of literalises the idea that love is stronger than death, but not in a way that might make you gag. The lives of the dead are presented as having been interrupted by the little detail of their death. Many had people waiting for them, expecting things of them, misconstruing their actions because they never got the chance to explain. And a worse kind of purgatory awaits these people, because if they left their loved ones on bad terms, they won’t be given the position of respect on the ofrenda that’s necessary to make their annual visit. If you’re not on that ofrenda, you may never be, and real, permanent death is the next and final stop on this journey. Heavy stuff for a kids movie, but Coco never treats it that way. There are, as you might expect, lots of amiable skeletons with a bad habit of disassembling in funny ways, seeing as how they’re not held together by cartilage. There’s a street dog who looks kind of like a rag with the water recently rung out of it, scrambling and slobbering his way into the afterlife alongside Miguel. There are mythological creatures that resemble Mexican folk art sculptures, with boldly contrasting colours that will make your head spin. It’s a gorgeous movie, it’s a fun movie, and it’s light on its feet. It doesn’t score as high as Inside Out in terms of actual comedy, but in most important respects it’s a close relative, so to speak. “But will it make me cry?” you may be wondering. Does a duck quack? Coco has a wonderful climactic usage of its soon-to-be-Oscar-nominated original song, “Remember Me.” The plea in that song’s title is completely superfluous. We’ll be remembering Coco and talking about it in the same conversation as Pixar’s all-time greats.